← You Know You`re In Japan When…..
It`s time for another captivating installment of our continuing series. We switch our attention to practices less commonly discussed in the journalling done on the plane ride home, however, that doesn`t mean it isn`t exciting. 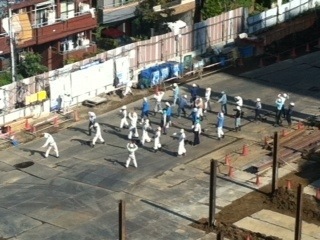 “You know you`re in Japan when you stare at construction workers.” Perhaps openly goggle might be a better description. The reasons are obvious. Just like women in the US who walk by a crowded construction site to find themselves the center of attention, these guys too are tired of the catcalls, stares, and overt gestures of affection. But women like me continue anyway in appreciation. So let`s continue. These guys are style makers thus drawing attention to themselves. Wearing a particular pant called “whisker pants,” these wide legged issues swish the sides of the buildings to which they are attached letting them know that they are in fact still attached. Like a cat`s whiskers,the pants alert them to their position relative to the building. When the pants lose contact to the building they are in danger of falling. Hold still- I`m trying to get a picture. 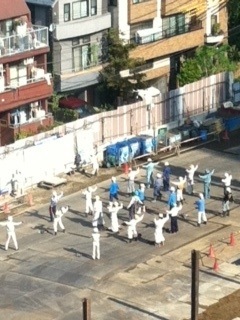 Taken from my hidden perch safely inside the Tokyo American Club Gym, these fellows started every morning at 8:00 AM sharp. Taking a look around the gym, and then letting the eyes wander down to the guys as they moved in to some Tai Chi…. It is a different picture…. had me debating the merits of the gym workout. The guys admired spied upon seen from my hidden look out were definitely better at yoga than anyone I could see in my immediate vicinity. No matter how hard I stared, I never managed to burn their shirts off with my blistering stare. Just another reason to visit Japan. This entry was posted in Moving to Japan, Uncategorized and tagged Amblerangel, Construction Workers, Culture, Emily Cannell, ExPat, Hey From Japan- Notes on Moving, Humor, Moving, Tokyo, Travel. Bookmark the permalink. Thanks for sharing! Sounds like y’all are having quite a wild ride! The world is a funny place right? Hey! I think I would like a pair of those whisker pants! I’m all torso so the pants would look ridiculous on me- but I too find them really cute! last week i sat next to a guy who had the upside-down-Hammer pants on and they smelled so bad of paint thinner..or whatever, I had to get up and sit at another place! Why thank you so much Book worm! I am so flattered! Ill respond as soon as I’m blogging again if the kids EVER go back to school. LOL! Sometimes you completely remind me of one of my best girlfriends from college. 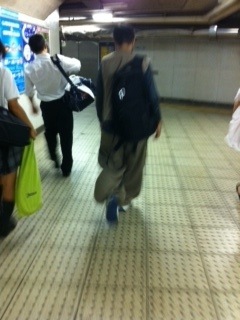 She was a super ninja, too, and took the best photos/got the best info if it was in her favor to have said photo/info. No scruples whatsoever. I loved it, and it made for some of the best college stories ever.